Heritage Foundation has posted an excellent article that gets past the spin/hype/distortion that FAA has deployed in their recently imposed ‘Drone Registry’. A strong case exists to show that FAA’s real intent is simply to ‘look busy’, as they very publicly impose regulations upon flying toys made of foam and typically weighing far less than your average duck. Notably, too, during the six decades before the registry was started in December, FAA had consciously chosen to let model aircraft operators ‘self-regulate’ … even with much heavier and far more dangerous powered model aircraft (in fact, there was even a history of model airplane accidents with injuries and even fatalities). Due to its clear arbitrariness, this major FAA policy shift is at the core of a lawsuit, Taylor v. FAA, filed on 12/24/2015. Mr. Taylor argues that FAA violated Congress’ UAS guidance in the last FAA Authorization … the same horrible legislation which FAA used to justify NextGen impacts without environmental review (see the FAA Modernization and Reform Act of 2012, 2/14/2012). In early 2012, within the same congressional legislation that enabled FAA to impose impactful NextGen routes without meaningful environmental review, FAA was directed to accelerate ‘integration of unmanned aerial vehicles’ into the National Airspace System. Deadlines were set, and FAA has consistently failed these deadlines, but FAA did eventually get around to creating some rules. FAA also created an exemption process, enabling so-called ‘commercial operators’ to proceed without compliance to the new rules. FAA has since granted more than a thousand exemptions (searchable list of 1,451 exemption entries, with links to PDF copies). Each exemption has required dozens of hours of work on both ends of the process: the applicant (or their well-paid attorney) has to create typically 20-50 pages of documentation, and FAA lawyers and others then spend dozens of hours reviewing the application and drafting a ‘decision’ filled with boilerplate that typically runs 8-10 pages long. Generally, the exemptions require flight no higher than 400-feet above ground level, and the operator must have earned a costly FAA pilot certification. In many cases, FAA has also submitted the exemption applications for publication in the Federal Register, in accordance with the NPRM rulemaking process. One of the latest FAA exemption approvals goes to Peter Sachs, a Connecticut attorney developing a specialty in unmanned flight. Here, he was granted approval to fly a paper airplane with a tiny propeller … so long as he uses an FAA-licensed pilot to perform the flight and flies low to the ground. Just a paper airplane, which clearly could have no significant impact on any real aircraft. Perhaps a more intelligent FAA rule (and one that would provide lots of relief from aviation noise) would be to mandate all manned aircraft minimize flight time below say 2,500-feet above ground level (AGL), and do all level cruising flights at no less than 2,500-feet AGL. For the record, FAA’s current helicopter rules essentially allow helicopter pilots to cruise right at ground level, and fixed-wing planes are legal at just 500-feet above ‘uncongested’ terrain and 1,000-feet above ‘congested terrain’ (whatever those terms mean). Furthermore, the rules promulgated by FAA at FAR 91.119 are loaded with loopholes that render them entirely unenforceable; for example, ANY pilot can justify low flying, simply by claiming he or she needed to be at that altitude to transition to or from their cruising altitude. It seems rather incredible that this much busywork should go into creating rules, yet the rules are so arbitrary that the agency quickly grants rule exemptions to well over a thousand applicants. And all of this fuss over objects (radio-control models, and even paper airplanes now!) that just four years ago were considered ‘recreational’. One has to question just how intelligent a rule is, when thousands of exemptions are promptly issued. Imagine if our state DMV’s arbitrarily issued 30mph maximum speed limits for our cars, then granted tens of thousands of waivers, each accompanied with a tiny decal to go onto our cars. Yes, it would be absurd and expensive, but it sure would keep lots of state DMV employees busy. … correcting the employee fatigue issues that continue to haunt pilots and controllers? FAA could do so much more, if it chose to serve the People, not just the industry players. The Front Range west of Denver offers spectacular vistas, like the Flatirons shown above, just south of Boulder. Ample sunshine makes it a natural for people to be outside. Many are drawn here for the opportunity to have an active and outdoor lifestyle. But, due to lack of effective FAA regulation, what might have been John Denver’s ‘Rocky Mountain High‘ has instead become a noise nightmare reminiscent of Jack Nicholson in ‘The Shining’. Repetitive noise, just like intense silence, drives people crazy. Northeast of Boulder an outfit called ‘Mile-Hi Skydiving’ has been impacting quality of life around Longmont since the mid-1990’s. It is a classic example of the skydiving impacts that FAA refuses to address, just like happens in hundreds of rural areas around the country. Typically, these outfits set up business just outside large urban centers. In Portland, OR, for example, a skydive company intensively advertises on busses and bus shelters to draw customers out to Molalla. A few city-dwellers then drive out to the country and pay for a cheap thrill ride, oblivious to the fact they are destroying the country lifestyle below. The flights are under the south arrival corridor into [KPDX], so way back in 1991, FAA officials coordinated with the operator to do their climbs about 8-miles to the northeast of their airport [OL05]. Most people in that area are unaware of why they are subjected to so much airplane noise, particularly intense on weekends and nice summer days. As a business, they take a fee from each skydiver, to add to their company profit. But that is not the only ‘taking’. They also take peace and quiet from thousands of local residents who must endure the low-frequency reverberating drone that destroys their summer days. Worse yet, the impacts also happen for hours and even full days in the other seasons, for year-round operators like Mile-Hi. The local residents lose quality of life; they get no compensation for their loss. They can complain to FAA, who will routinely tell them to take it up with the business or airport. They can complain to the business or airport, who will tell them the program is ‘FAA compliant’ and refer them back to the FAA with their complaint. The citizens face a black hole where neither operators nor FAA officials are held accountable; thus, real citizens effectively have no rights to resolve an adverse impact that FAA condones. The matter has irritated local residents so much that they filed a lawsuit. A group called Citizens for Quiet Skies gradually formed, and in late 2013 the group and seven individuals filed a lawsuit (Case# 2013CV031563) at the U.S. District Court in Boulder, CO. A 5-day trial was held last week. District Court Judge Judith LaBuda plans to do a site visit on May 1st, before issuing her ruling. The group raised funds to cover their legal expenses, and some incurred personal debt. Of course, people should not have to take on personal debt to right a wrong, and they would not have to if FAA would properly apply environmental considerations to regulate operations like Mile-Hi Skydiving. Nor should people have to endure harassment by aviation companies or even by aviators in flight. In May 2012, Mile-Hi sent Kimberly Gibbs a letter, with a “Have a Great Summer!” poster, as well as a bumper sticker that read ‘I love airplane noise!’. Weeks later, there was the Memorial Day family gathering in the backyard, when a helicopter suddenly appeared over the treetops and hovered at less than 200-feet altitude. This incident is a blatantly serious case of aviation harassment, the sort of thing FAA would aggressively act on, if they were not so in bed with the industry they fail to regulate. We should all be able to relax in our homes. With summer coming, we are entering the peak season for aviation impacts by parachute operations. If you are impacted at your residence, please contact the aiREFORM.com administrator (ReformFAAnow at Gmail dot com) to help us compile more data documenting the extent of this U.S. aviation problem. EPIC.org is the Electronic Privacy Information Center, an independent non-profit research center based in Washington, DC. According to their website ‘about EPIC page’, EPIC is all about fundamental democratic values. EPIC works to protect privacy, freedom of expression, and to promote the Public Voice in decisions concerning the future of the Internet. EPIC maintains two of the most popular privacy web sites in the world – epic.org and privacy.org. Aviation activities are rapidly transitioning from manned vehicles (fixed-wing and helicopters) to unmanned aircraft systems (aka UAS, or ‘drones’). This transition can provide great benefits, such as reduced energy use and reduced air and noise pollution. But, this transition also has the potential to lead us to a new world where the skies become crowded with silent drones monitoring all our activities, and even being used to ‘take out’ arbitrarily defined threats. EPIC.org is one of the leading NGO’s working to ensure that the needs of the larger Public are being properly considered, during the development of these new technologies and regulations. In the weeks following President Obama’s signing of FMRA, a petition was filed with FAA, asking the agency to “”conduct a notice and comment rulemaking on the impact of privacy and civil liberties related to the use of drones in the United States.” EPIC was joined by over 100 other organizations, experts, and members of the public in presenting the petition. 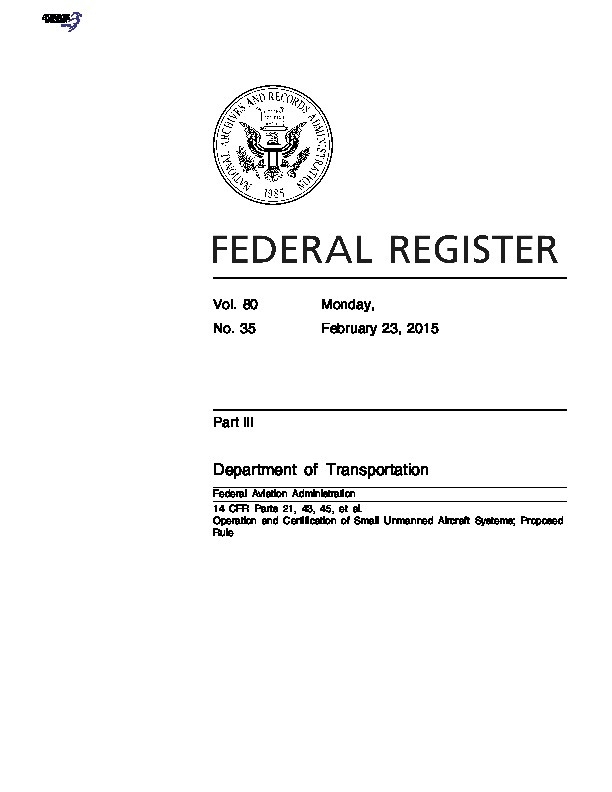 FAA already had a Notice of Proposed Rulemaking in the works, and it was published in the Federal Register on March 9, 2012. Given the short notice, it was reasonable that FAA did not include the privacy issues in this NPRM. Instead, FAA added a solicitation for privacy-issue comments to a later NPRM, published in February 2013. Consequently, the entire issue of drone privacy impacts has been inadequately addressed by FAA. So, a full 31-months after the February 2012 petition, FAA finally got around to sending a weak ‘reply’ letter to EPIC.org. All of this suggests we would be far better served, if FAA would relinquish regulatory authority over the low-altitude airspace. A more flexible – and more responsive – authority should be handling low-altitude drone regulations … perhaps even local or state officials. And, their regulations should be required to conform with reasonable (and legislated) privacy protections. A few years ago, FAA grabbed control of the U.S. drone industry, primarily as a project to apply excess employee resources. FAA has since banned most drone uses in the U.S., and the nascent industry is foundering while FAA falls behind in the development of industry rules. U.S. operators have been driven underground; their ability to locate funding or procure insurance is impacted, and potential customers are deterred by FAA’s daunting (though arbitrary) rules. In four years, Service-drone.de GmbH has emerged as a promising player here in the rapidly expanding commercial-drone industry. The 20-employee startup has sold more than 400 unmanned aircraft to private-sector companies and currently is pitching its fourth-generation device. This is ridiculous. If FAA really cared about safety, they would be accelerating deployment of drones to eliminate unsafe helicopter uses, such as pipeline surveys. Plus, the altitudes needed for drones are safely underneath the altitudes used by regular aircraft. Frankly, the only possible traffic for these drones would be low-flying helicopters, which are flying unsafely if they are in fact cruising within a few hundred feet of the ground. FAA could regulate these helicopters — and needs to, which would also reduce noise impacts (e.g., see the helicopter problems on Long Island, NY or near Palos Verdes, CA). So, in the larger analysis, FAA is continuing to refuse to properly regulate helicopters, and FAA is impeding drone development, all of which sustains the status quo for aviation today in the U.S.